A Night at the Movies – concert tickets on sale now! Love films? Love soundtracks? 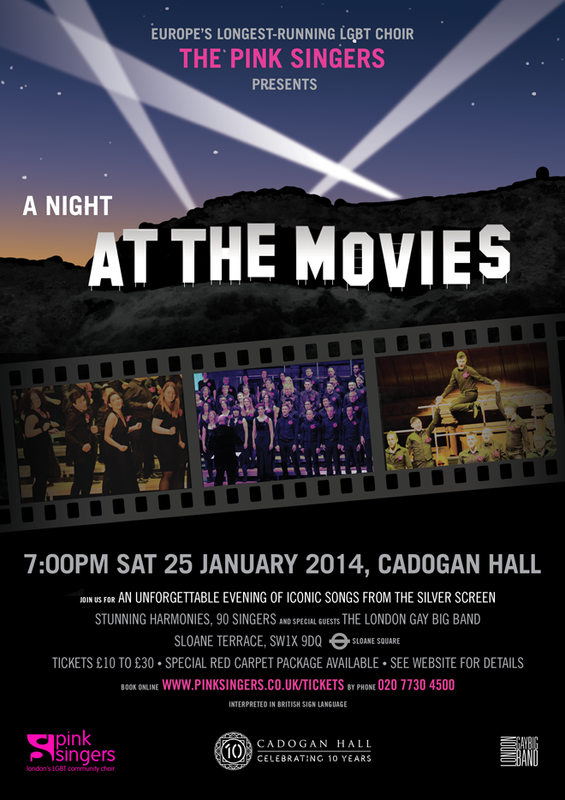 Then join the Pink Singers for A Night at the Movies – an audio-visual choral blockbuster at Cadogan Hall on Saturday 25 January 2014. Experience the magic of cinema from the minute you arrive on the red carpet – with popcorn, usherettes and Hollywood glamour. Featuring over 80 singers, we’ll be performing a host of iconic songs from the silver screen, including Moon River from Breakfast at Tiffany’s, Ride of the Valkyries from Apocalypse Now, Circle of Life from The Lion King and Take My Breath Away from Top Gun. We’ll be joined on stage by special guests the London Gay Big Band, for an unforgettable evening of eight-part harmonies and big band sounds. And why not treat yourself to the special Red Carpet package and you’ll receive the full star treatment, including a private VIP drinks reception and the best seats in the house, for just £50. Book your tickets online now or by calling 020 7730 4500.